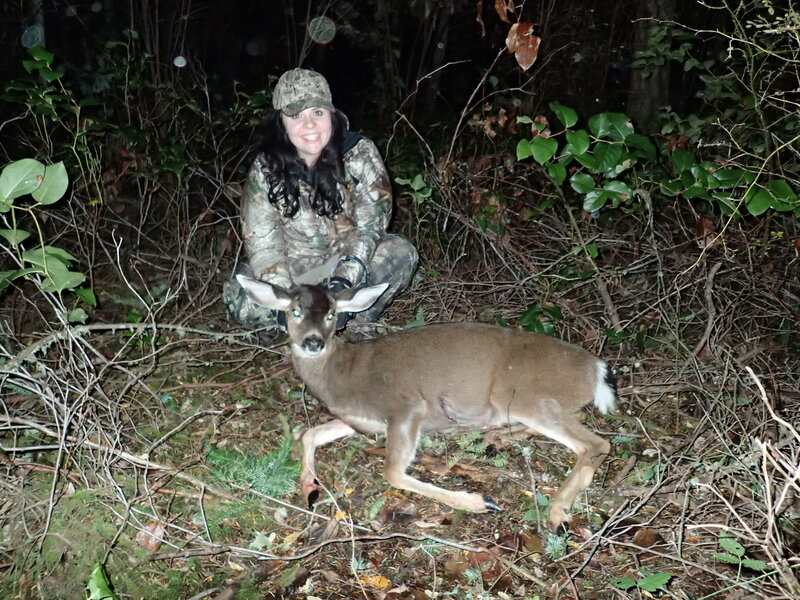 If you missed Shooting My First Deer – Part 1, read it here! I had just shot my first deer and now the hard work started as we began to track the blood trail. Kelli and I began make our way through the thick salal bushes that were much taller than us. To be honest, I don’t know how she cleared a path for us to follow because the second we went through, the path was swallowed up by branches and leaves again. Trying to follow a blood trail in that brush seemed impossible. We worked our way to one clearing and no blood was to be found. We looked in every direction she could’ve gone but nothing. 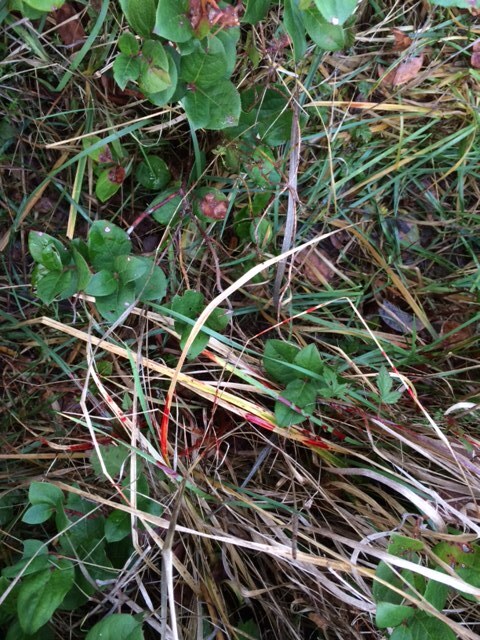 We each took turns going back into the salal to try and see if the blood trail moved farther into it in another direction. Eventually we decided to move from where we were to try and get farther back in the brush near where we saw bushes move. We made our way back in and again came to another small clearing. I looked down and there was another patch of blood—back to tracking once more! The sun was beginning to go down and being in the thick cover of trees and bushes meant we had even less light. Ed went around to the other side of the brush in case we could push her out. He also had a late season tag and brought his muzzleloader if he saw her. After the blood trail disappeared once again, we decided we needed to get out of there before it became dark. As we struggled to get through the piles of branches, we also had several fallen trees that blocked our path. It wasn’t easy getting out of there. 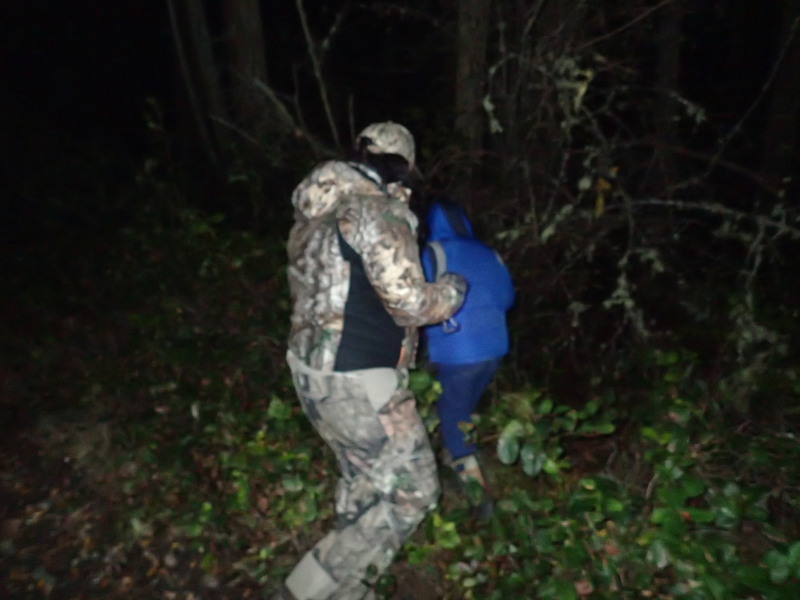 We were making a lot of noise snapping branches, and the doe ended up moving out of the brush in front of Ed. He quickly got a shot on her and we heard it ring out around us. It took us at least ten more minutes to forge a way out of there. Ed told us how the deer moved out in front of him and then told us where he thought she went after he shot her. We marked the spot and headed back to the house to eat dinner before going back to find her. Struggling to find her was weighing heavy on me. A lot of thoughts went through my mind. Should I have shot? Was my shot bad? Will we find her? What if we don’t find her? It was a whole new set of feelings I’d never experienced before. After dinner, we got ready to head back out. This time their son joined because he’s great at tracking blood. We went back to where she was last seen. We found blood, as well as some of the lung or diaphragm, a good sign she likely died quickly after that shot. Not 20 yards in and we found her. I was really relieved and happy, which is pretty evident by my smile. 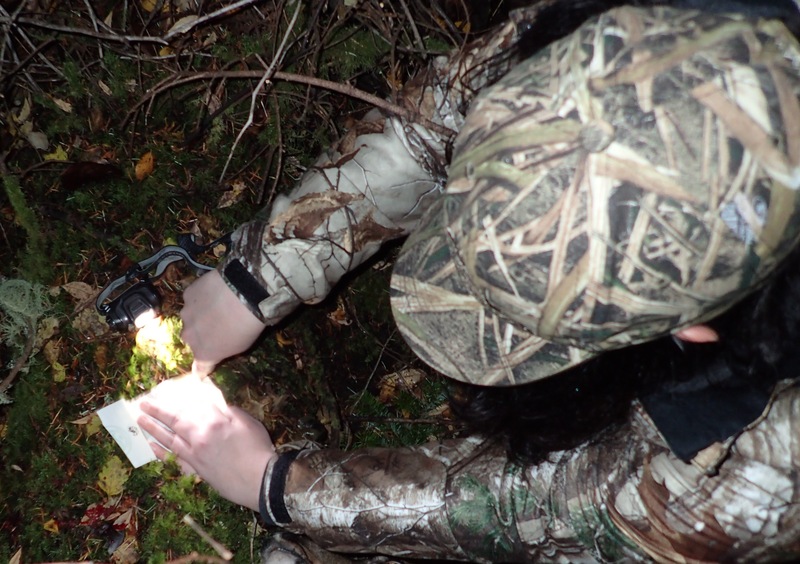 Notching my first deer tag! I notched my first deer tag, hopefully the first of many. Then we headed back to their garage so I could learn how to gut and skin a deer. I’ve heard a lot of people say this part is gross and I’ll probably have trouble with it, nope. I actually found it pretty fascinating. Once Ed was able to get in there, we could see where the shots went. My shot went through the upper part of her front leg, hit her lower heart and then exited. He wasn’t really sure how she was able to go as far as she did. All he could think was since the chambers were still intact, it kept her going longer. Or she was moving purely on adrenaline. He’d never seen a shot do that to a heart. His shot was a little farther back than mine and went through her diaphragm, putting her down almost instantly after he shot her. Both the shots were low enough that most of the fur was still nice. I’m going to get it tanned as a way to remember my first deer by. 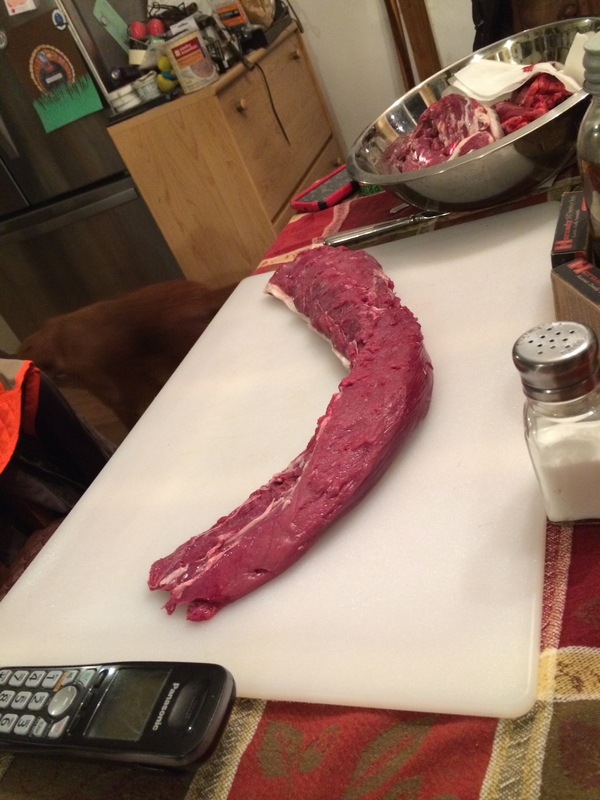 After skinning the deer, he showed me how to get out the backstrap and tenderloins. It’s interesting to see where different cuts of meat are on an animal. He quartered the rest of the deer so I could take it home and butcher the rest with my brother. The next morning, he cooked a breakfast of backstrap scraps with onions, mushrooms and served it with a side of eggs. So delicious! I’m not quite sure how to put into words how thankful I am for the deer. It’s a mixture of feelings… respect, gratitude, and appreciative. I’m so thankful I now have a freezer full of meat that will provide for many good meals the next year. I learned a lot… I mean a lot. About myself and about hunting. I’m definitely hooked and I can’t wait to get back out next season so I can hopefully fill my freezer again!